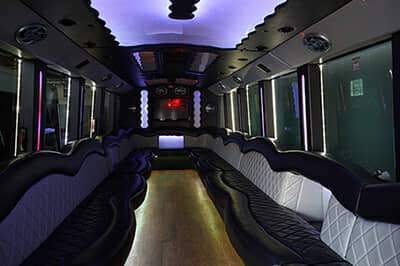 At Metro Detroit Party Bus you'll find an enormous fleet of party bus vehicles just waiting for your booking! We have spent a hearty amount of time assembling what we believe is the perfect fleet. 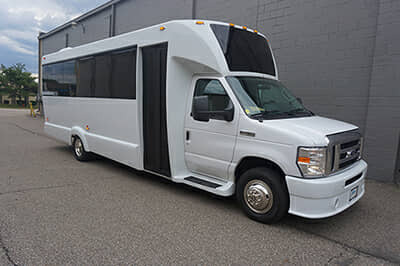 Accommodating anywhere from 16 to 35 passengers, and with a variety of styles and looks, you can really customize your night on the town simply by choosing which bus fits with you best. We welcome you to come on down and take a look at our buses before you choose one, but if you can't do that, this page is the next best thing. We've done our best to list all of their features here, but if there's anything that you require that you don't see listed, just give us a call for clarification. Each bus seats up to a certain amount of passengers based on a 14 inch seat width per person. 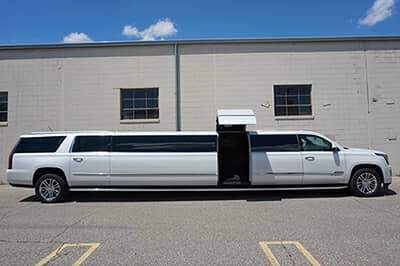 Our 10 Passenger Party Van is the smallest in our fleet, offering a cozy interior along with most of the amenities that you find in any limousine. 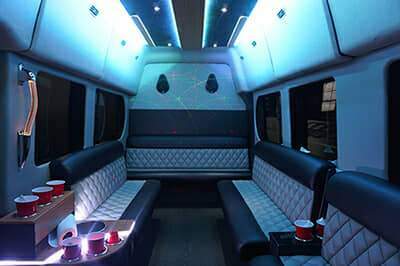 Gorgeous leather seating wraps around the perimeter of the van so that you can kick back and enjoy your conversation with your party. The utmost in comfort. 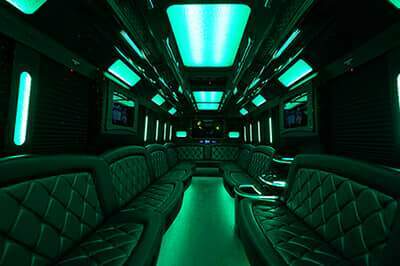 The fiber optic lighting is so mellow and relaxing, and yet cool enough to amp up a lively party too. 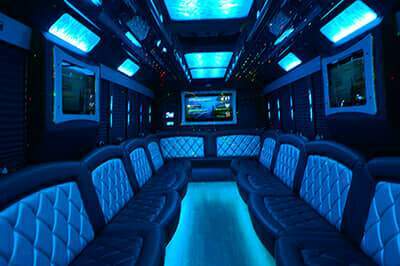 If you like your decor a little more understated, this bus is styled in a simpler yet very sophisticated way. There's a gorgeous flat screen television that you will enjoy both on the road and off... when the bus is moving you can take advantage of the DVD player, and when you're stopped you can use our premium HD antenna that pulls in network television! 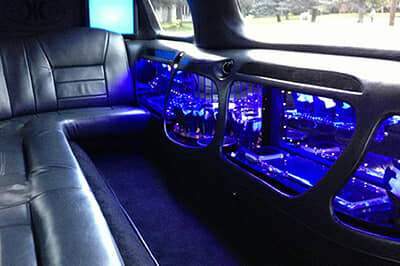 The sound system is the best in its class! Just bring your own CDs, or perhaps your iPod to connect to our system, and you're good to go. Gorgeous acrylic bars complete with lighting and coolers. The wood flooring for an extra touch of elegance. Built-in cup holders to prevent spills, and tinted windows for complete privacy while you're driving! 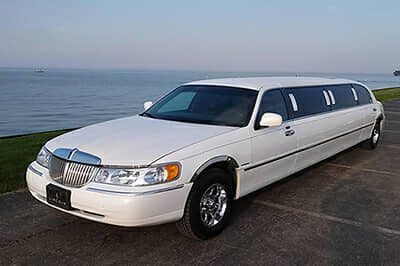 Our Town Car for 12 is one of the smaller vehicles in our fleet, offering a cozy interior along with most of the amenities that you find in any limousine. Our 12 passenger Range Rover is the smallest bus in our fleet, offering just the perfect amount of space along with most of the amenities that you find in our bigger buses. 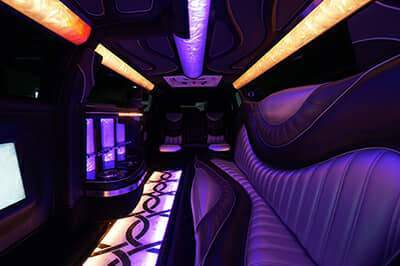 Gorgeous leather seating wraps around the perimeter of the bus so that you can kick back and enjoy your conversation with your party. The utmost in comfort. There's a gorgeous flat screen television in the bus that you will enjoy both on the road and off... when the bus is moving you can take advantage of the DVD player, and when you're stopped you can use our premium HD antenna that pulls in network television! 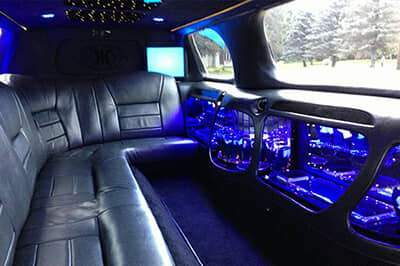 The sound system is the best in its class, with booming subwoofers to provide that killer bass that you love so much! Just bring your own CDs, or perhaps your iPod to connect to our system, and you're good to go. Built-in bars complete with lighting and coolers. 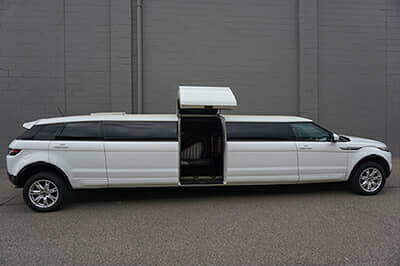 The 20 passenger capacity of our Escalade makes it perfect for smaller events such as bachelor, birthday parties and more. You won’t be missing any of the amenities our larger buses provide! 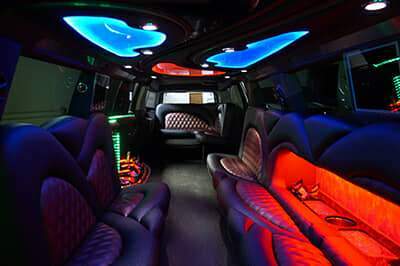 This hummer comes equipped with a state of the art sound system that can play CD’s and also has iPod hookup capabilities, so you can totally personalize the soundtrack to your bumping party! Fashioned with high definition, flat screen televisions for your viewing enjoyment. Make sure to bring your favorite DVD’s to play on the provided DVD player. 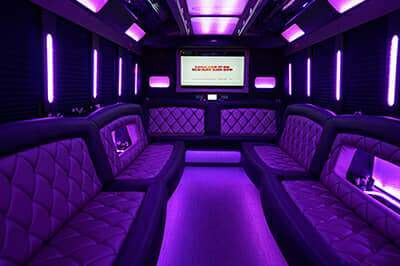 Complete with mesmerizing mood lighting throughout the vehicle to set the mood. This vehicle comes with convenient bars inside and coolers to hold all of your cold refreshments chilled with ice provided by us! You’ll love the well crafted leather seating, and rich polished hardwood flooring throughout. 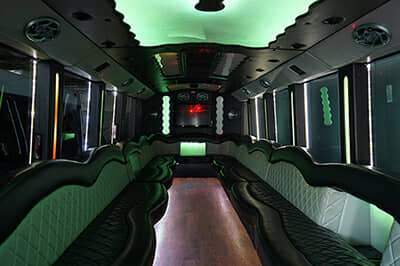 Our 22 passenger party bus is perfect for those gatherings that are just a bit larger in size. The exterior is a crisp sophisticated white, and the interior is decked out in bright yet mellow blues. The LED lighting is an especially modern touch that we love. Feel like getting adventurous at that bachelorette party? Why not take a turn or two on the dance pole / stripper pole? 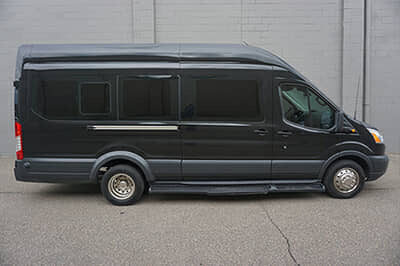 The dark tinted windows will keep you safe from prying eyes outside, so you can have all the fun you want inside the bus! There's a nice loud sound system in this bus, and you can bring any iPod or MP3 player to hook up to it to play those favorite playlists of yours! We already mentioned the dark tinted windows, but we'll mention them again in case you missed it. This is essential for privacy on the road. 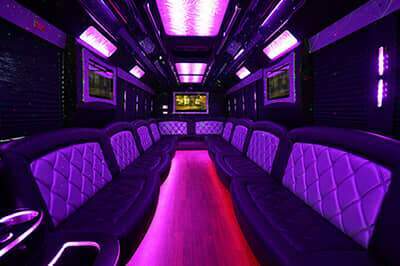 The wood flooring and mirrored ceiling are two features that we love when you want to turn the bus into your own little dance club! 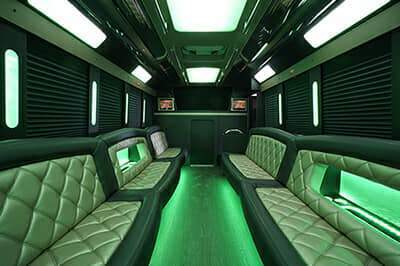 The premium leather seating is very comfortable in this bus, and the layout of the seats makes it particularly easy for you to chat with your entire party. The bar in this bus is very classy, done in granite, complete with a cooler and a very convenient cup dispenser. Built-in cup holders make it much easier for you to just chill out on the road and not have to worry about holding on to your drink. Prevents spills too! 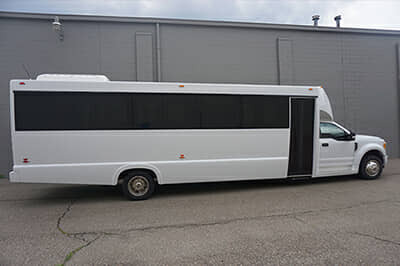 The 30 passenger capacity makes it great for all types of events. Get your party started with the booming, professional grade sound system, complete with thunderous bass. It comes with a CD player with the capability to hook up your iPod for a personalized music play list. Polished granite countertop bars stocked with ice, with added coolers for all of your refreshments. 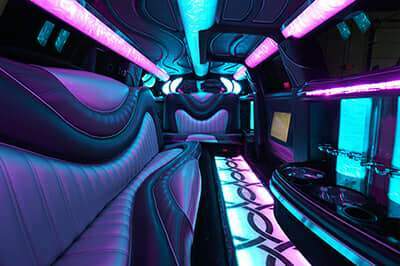 Fashioned with a chrome stripper pole, color changing LED walls, ceilings, steps, and coolers for that unique party atmosphere. Huge flat screen televisions with DVD players to play your favorites in cinema! 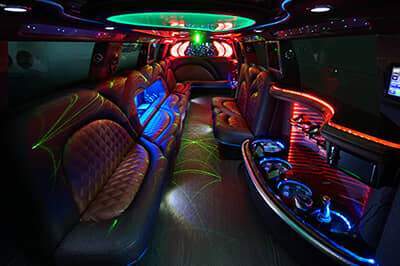 Custom hardwood flooring and leather seating throughout for your comfort. Professional grade speaker system complete with booming subwoofers, CD player, and iPod hookup so you can fully customize what you want to listen to. Three high definition televisions with DVD/Blue Ray player attached for all of your entertainment purposes. Gleaming granite top bars with spacious coolers stocked with ice for your refreshments. 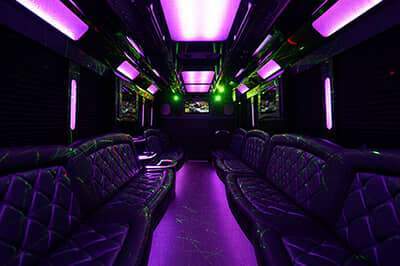 Complete party atmosphere with chrome stripper pole, color changing mood lighting surfaces throughout entire bus. 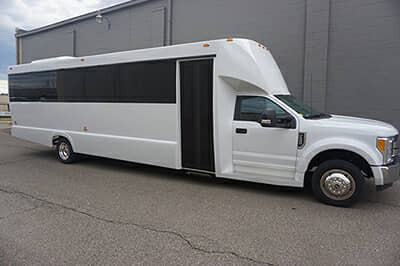 Customized crafted leather seating for up to 34 passengers and exotic hardwood flooring makes it perfect for all events, especially larger ones. Don’t worry about others looking in with our professional grade tinted windows. Built-in cup holders are also a plus, to prevent spills and also to prevent you from having to worry about holding on to your drink while the bus is moving! 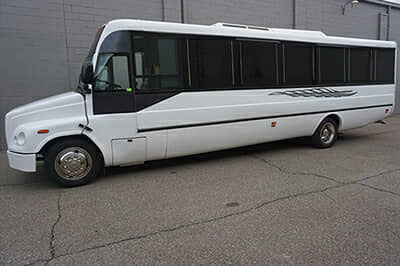 One of our largest buses, this monster will seat up to 35 passengers in comfortable leather seating. Two granite topped bars make enjoying refreshments easy with built in coolers stocked with ice. You’ll love the five 50” flat screen televisions, fitted with a DVD player so you can watch your favorites on multiple big screens! Be heard with the professional sound system that’s installed with subwoofers, iPod and CD player capabilities for customized play lists. 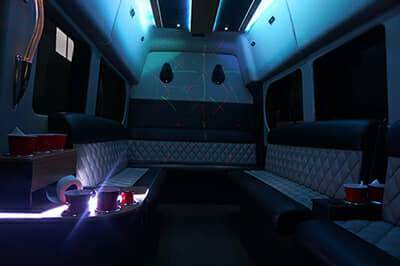 For that party vibe, we’ve fitted this bus with its very own stage area, LED color changing walls, ceilings, and a chrome dance pole. There's a dance pole / stripper pole for anyone in your party who may want to take a spin or two!